Winter is slowly but surely making its way out, but that doesn’t mean we’re not still freezing our buns off in the evenings. The sun might make an appearance or two during the day, but as soon as its gone, all the warmth goes along with it. We’re still stuck wearing multiple layers and an uncomfortable amount of socks to keep the cold from affecting us, wishing that we could hug a space heater without being burned. 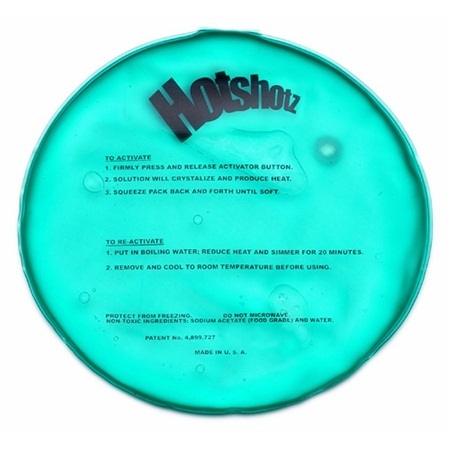 Seeing that you don’t want to pick up an electronic device and hug it because it could possibly cause a fire, the HotShotz Round is a perfect replacement. The contents are a non-toxic food-grade solution that look like water before activation, and after pressing the button will give you quite the show. The clear liquid looks as if it’s being frozen before your eyes, and once the color and texture of the solution changes completely, you’ll have heat for 4 hours! While it heats up in around 20 seconds, it will take 20 minutes of boiling it in water with a cloth underneath it to reset the solution. If you forget the cloth, you chance melting a hole in the housing, and if you don’t boil it long enough, the crystals will reform as it cools. The boiling aspect is a small annoyance, but it does sanitize the pack, doesn’t take up electricity for the hours of use, is reusable for as long as you take care of it, and costs around $46. There are different sizes with varying price points, but the one I bought for myself is the round, as it can cover everything from cramps and back pain to tired feet and hands.